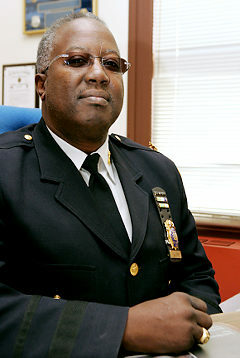 Fool Of The Day…NYC Police Assistant Chief Gerald Nelson | PoliticalBlack.com"The Total Non-Partisan Political Web Site For African-Americans Voters"
Where Did This Fool Come From? The cops say when Assistant Chief Gerald Nelson (above) found out they had lodged a complaint about a black sergeant’s N-word-laced rant, Nelson repeated the N-word. Looks like this guy is full of self hatre. I have known Chief Gerald Nelson on both a professional and personal level having been his Administrative Aide back when he was a Sergeant with the NYC Housing Authority at Housing Police Headquarters, and I have always known Chief Nelson to be honest, upright, impartial and most of all – dedicated and hard, hard working. The job he has is both stressful and hectic, anyone under the pressure of keeping a borough like Brooklyn properly policed is bound to come under scrutiny, criticism and most of all pressure, pressure, pressure. Chief Gerald Nelson is nobody’s fool.